Here is a plug for one of my favorite products, Imagine Organic Soups. "Imagine Foods was founded in the Missouri countryside by Robert Nissenbaum and a partner in 1982. A longtime advocate of natural and organic foods, Robert had previously opened Morning Dew Organic Food Market and organized the founding of the Sunshine Inn, one of the early natural foods restaurants, both in his hometown of St. Louis." I love them because they make great bases for impromptu chowders. I stumbled across a new flavor: Corn & Lemongrass at the store and tucked a box on the larder shelf. It came in handy yesterday when it was cold and rainy. I had a few leftover shrimp so I made myself a chowder. 1. Fry the bacon in skillet until crisp. Remove and crumble. 2. Add the sliced garlic to the bacon drippings and begin cooking. 3. 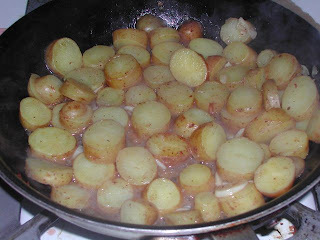 After about 1 minute, add the sliced potatoes and saute till tender, about 5 minutes. 4. 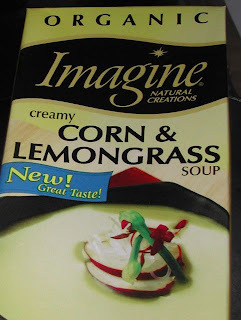 Pour the Imagine Corn & Lemongrass soup into a sauce pan and add the potatoes and garlic. 6. Add the crumbled bacon and chopped cilantro, leaving a bit for garnish. 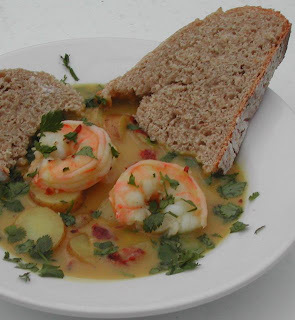 Serve in a bowl with a nice bread.